Ruby Quantson Davis is a resident researcher at the Kettering Foundation. She assists in developing the foundation’s international curriculum and research aimed at strengthening the Deliberative Democracy Institutes. Quantson Davis is a development practitioner with more than 16 years’ global experience in public policy research, deliberative conversations, citizen advocacy, and institutional development. She specializes in strengthening capacity in the areas of conflict transformation and peace processes, electoral politics, community development, and citizens’ politics. A native of Ghana, Quantson Davis partners with citizens’ groups and individuals in various contexts and cultures who are working to strengthen their capacity to be active leaders in their communities and to engage institutions in decision making at various levels. Since 2011, Quantson Davis has explored the potential of deliberative processes in communities that are experiencing divisiveness caused by political polarization, religious differences, and ethnic and racial divides. Her research reflects on the spaces within which civic work and practices occur to promote peace and build civic agency. Guided by questions such as “how is the civic space utilized and sustained in the midst of polarization?,” Quantson Davis’ interest is to observe, document, and share practices and learning across the world. In recent years, she has worked as a consulting researcher and evaluator and provided technical support to nongovernmental organizations. Prior to this she developed and taught courses on peace, conflict, and security at the Kofi Annan International Peace Keeping and Training Centre (KAIPTC). Quantson Davis was an international fellow at the foundation in 2005, during which she authored an issue book titled The Challenge of Public Safety: What Must We Do?, used in several forums and training workshops at the Institute for Democratic Governance in Ghana, where she worked for nearly a decade. For more than 14 years, she has supported the work of the foundation in various capacities, particularly serving on the foundation’s international faculty, helping to develop the Kettering Foundation’s international alumni network, and offering support to the work of the network in several parts of the world. She has moderated and led many citizens’ activities in Ghana and in various countries in Africa, the Fiji Islands, and the Pacific region as well as in the United States and Israel. 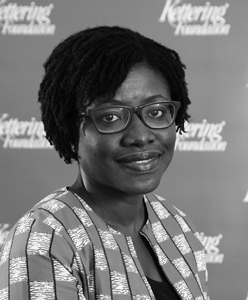 Ruby holds a master’s degree in international affairs from the Legon Centre for International Affairs and Diplomacy in Ghana, which fostered her interest in American and Ghanaian foreign policy, Africa in world politics, regionalism, and international law. Her dissertation was titled Crime and Security in the West African Region: A Case Study of Ghana and Nigeria. She has also had several professional trainings in NGO management, project management, and policy analysis as well as broad experiences in multi-stakeholder negotiations and processes. She has published in these subject areas. Multilingual, Ruby holds a bachelor’s degree in French and linguistics and speaks several Ghanaian languages.